The Domestic Movie Trailer for Michael Haneke’s Amour. Jean-Louis Trintignant and Emmanuelle Riva star in the French-language drama, winner of the 2012 Palme d’Or at the Cannes Film Festival. 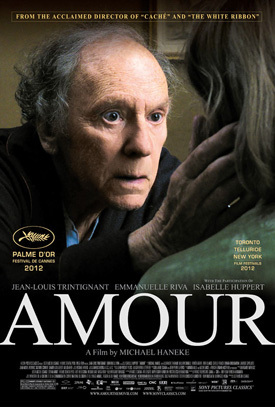 Watch the movie trailer for Amour below. The film explores what happens to a lifelong, harmonious marriage when the wife suffers a series of debilitating strokes that changes the couple’s life beyond recognition. MPAA Rating: (PG-13), for mature thematic material including a disturbing act, and for brief language.